The informal motto at CDPS is "Safer Together." Those two words are shorter than our mission statement, but capture its essence well. Working together, we make Colorado a safer place. In June, CDPS members' combined efforts to support the Special Olympics also proved that we are stronger and more successful together -- it's amazing to see the outcomes when we unite to achieve a common goal! CPDS members representing every Division in the department joined forces to support the Special Olympics through the Law Enforcement Torch Run on June 1, 2017. A total of 90 CDPS members joined the team and donated a total of $4,315 -- Making CDPS by far the No. 1 agency participating the Torch Run event. CDPS donations accounted for about one-third of the total donations raised by all agencies participating in this event. This was the first year CDPS participated as an entire agency, and the outcome far outpaced prior participation by any single CDPS division. to an athlete at the Special Olympics Summer Games. In addition to the Torch Run, CDPS Deputy Executive Director Rebecca Spiess and a number of Western Slope State Patrol members attended the Special Olympics Summer Games in Grand Junction June 9-11. 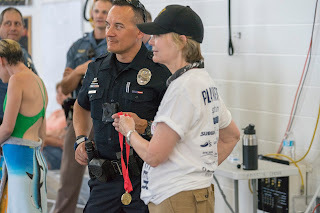 Spiess and local Troopers cheered on the athletes, helped to present medals, and joined other local law enforcement agencies in a show of support. Team events like these reflect the values and mission of CDPS. Internally, participating in collaborative efforts to give to the community strengthens our bonds and builds employee engagement; externally, CDPS involvement in community events like these enhances our relationships with those we serve and demonstrates our commitment to core values of service to others, community involvement, hard work, honor, duty, respect and unity. CDPS members' next charitable efforts in support of the Special Olympics will be the Tip a Cop event at Chili's restaurants throughout Colorado on July 9, 2017.